Feb 11, 2012 Residents of Kensington and other Brooklyn residents took to the streets today, on a gray and chilly winter day, to demonstrate their support for workers at a Church Avenue markeet and greengrocer, Golden Farm. The workers there, mostly from Latin American countries, have been cheated out of wages, forced to work long hours without overtime and paid less than $4.00 per hour in disregard of minimum wage regulations. This had been going on for years until March of 2010 when the workers decided to organize to put an end to their unjust treatment at the hands of an unscrupulous boss, a Mr. Sonny Kim. Now they are engaged in litigation and a determined fight back for fairness and decent wages, not to mention demands for compensation for their unpaid wages that they were cheated out of. They have reached out for community support and today it was forthcoming as a large crowd of several hundred residents and neighbors turned out to march and rally in their support. Here are photos from today's inspiring outpouring of community support. Channel 12 news reported on the background of this story here. 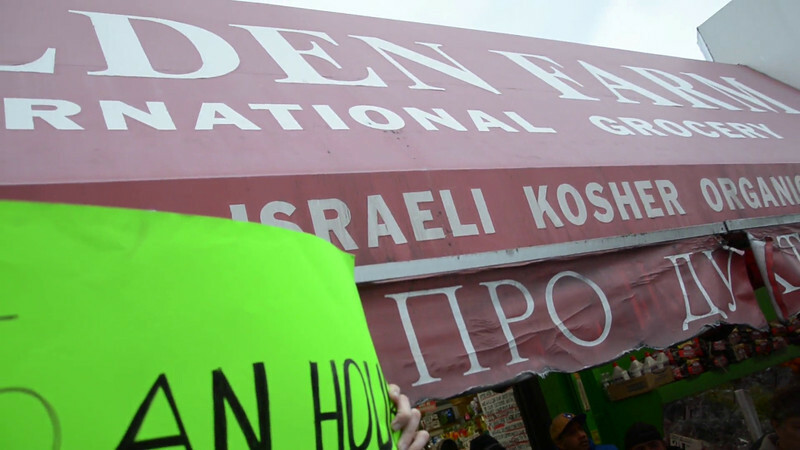 Press PLAY (>) above to watch a video of Senator Eric Adams expressing support for the rights of Golden Farm workers.